Melt the butter in a saucepan over low heat, and cook the garlic until tender, about 5 minutes. In a shallow bowl, mix the almond flour, Parmesan cheese, Cheddar cheese, parsley, oregano, pepper, and salt. Dip each chicken breast in the garlic butter to coat, then press into the almond flour mixture. 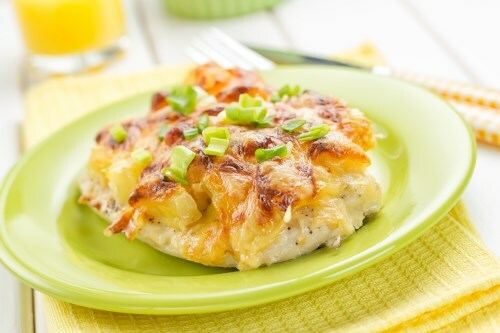 Arrange the coated chicken breasts in a 9×13 inch baking dish. Drizzle with any remaining butter and top with any remaining almond flour mixture. Bake 30 minutes in the preheated oven, or until chicken is no longer pink and juices run clear.